Rosanne Welch and Peg A. Lamphier. 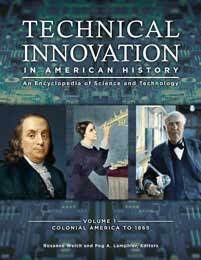 Technical Innovation in American History: An Encyclopedia of Science and Technology [3 volumes]. ABC-CLIO, 2019. ABC-CLIO, publisher.abc-clio.com/9781610690942. From the invention of eyeglasses to the Internet, this three-volume set examines the pivotal effects that inventions have had on society, providing a fascinating history of technology and innovations in the United States from the earliest colonization by Europeans to the present.